Innovation may bring a lot of good to society, but innovation is not a good in itself. History provides many examples of new technologies that have had serious negative consequences or that simply just failed to address significant societal challenges. This course discusses the concept of responsible innovation, its meaning and its significance by addressing the societal implications of new technologies and showing how we might incorporate ethical considerations into technical innovations. We will do so on the basis of technological case studies. Cases that will be discussed are, among others, nanotechnology, offshore wind parks, Google car, nuclear power, cloud computing, smart meters for electricity, robots in the care sector (carebots), low budget meteorological weather stations in Africa and CO2 capture and storage. During the course you may team-up with your fellow students to discuss the case studies in an international context. Moreover, students are encouraged to bring their own cases in dedicated discussion fora. This course is for all those interested in the relationship between technological innovations, ethics and society. It is especially relevant for industry, public, and academic professionals working on developing innovative technologies and students following a traditional technical curriculum who are interested in key value questions attached to their studies. 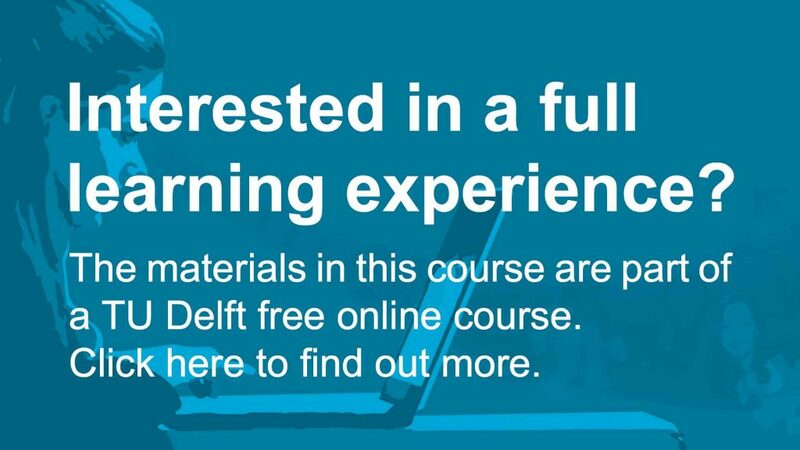 Responsible Innovation by TU Delft OpenCourseWare is licensed under a Creative Commons Attribution-NonCommercial-ShareAlike 4.0 International License. Based on a work at https://ocw.tudelft.nl/courses/responsible-innovation/.